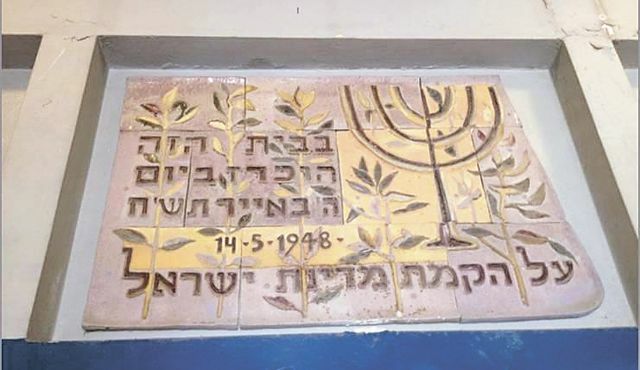 A ceramic relief by artist Chava Samuel was found recently during the renovation of Independence Hall on Rothschild Boulevard in Tel Aviv, the historic building where David Ben-Gurion declared the establishment of the State of Israel in May 1948. The relief had been concealed behind a board for decades. The piece had presumably been installed in the entrance to the hall in the fall of 1948. The relief features a seven-branched menorah and a Hebrew inscription: "In this building the establishment of the State of Israel was declared on the 5th of Iyyar 5708, 14.5.48." Samuel, who was born in Essen, Germany in 1904, was one of the pioneers of Israeli ceramics. She came to Israel in 1934 and opened the first ceramics studio of its kind in the Jewish community of Jerusalem. She later opened a workshop in Rishon Letzion as well. A number of her works were installed in public buildings. These include Zodiac Relief at the Kesem Cinema in Tel Aviv, where the first sessions of the Israeli Knesset were held, and ceramic walls in a number of locations, including one in the Yad Lebanim memorial in Rishon Letzion and another in the cellar of the Carmel Mizrahi winery in the same city, as well as one in the community center of Moshav Sitria. Samuel died in 1989.